How well is this person represented? Research on political representation generally focuses on groups, but sometimes we really want to know how well an individual is represented. A common approach is relying on questions of feeling represented — but there are many reasons a person may feel represented beyond objective ones. It is possible to express the level of representation at the individual level. I call this individual representation. This approach is based on a double comparison. 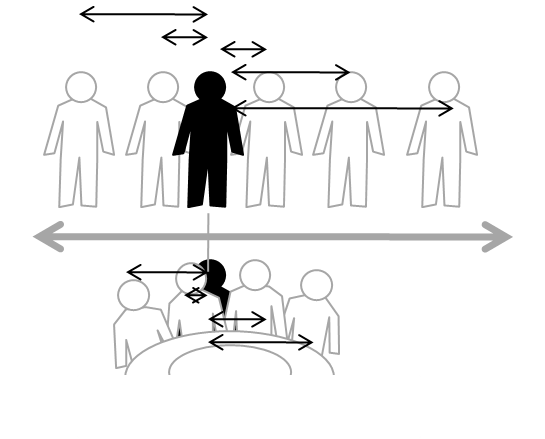 First, we determine how marginal the position of an individual is, given the positions of everyone else in the population (top of figure). Second, we examine how marginal the individual would be, were he or she placed among the representatives (bottom of figure). The result is a perspective of political representation that places the individual at the centre, not the representatives. We can now address questions such as whether individual representation affects trust in government or democracy. To calculate individual representation scores, you can simply use my R-code in the polrep package. I also have a spreadsheet solution available, but it’s inflexible. A final note, I do not advocate individual representation scores as replacement of existing approaches, but as a complement to open up new possibilities in research.